After an easy one-time setup, you and your members can move on to other matters while payments process automatically. Schedule payments to run indefinitely or until a particular amount has been paid. 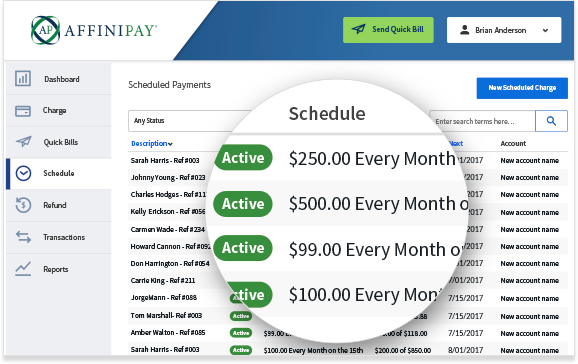 Set up, track, and manage payments effortlessly, right from your AffiniPay account. Save time and provide members with an exceptional, convenient payment experience by setting up payments once and letting transactions process automatically. Set up a Scheduled Payment in seconds by entering a member’s card information, the amount you want to charge, and the payment frequency into our secure portal. View all your Scheduled Payments in one place to check payment status, edit payment schedules, and project cash flow. Sit back and watch your payments roll in. When transactions run automatically, you can take the hassle out of payments for both your association and your members.